Deneen Pottery has been committed to conserving resources, recycling, and reuse since our founding more than 45 years ago. With the success and growth of our family-owned business, we have been fortunate to amplify our investments in going green. 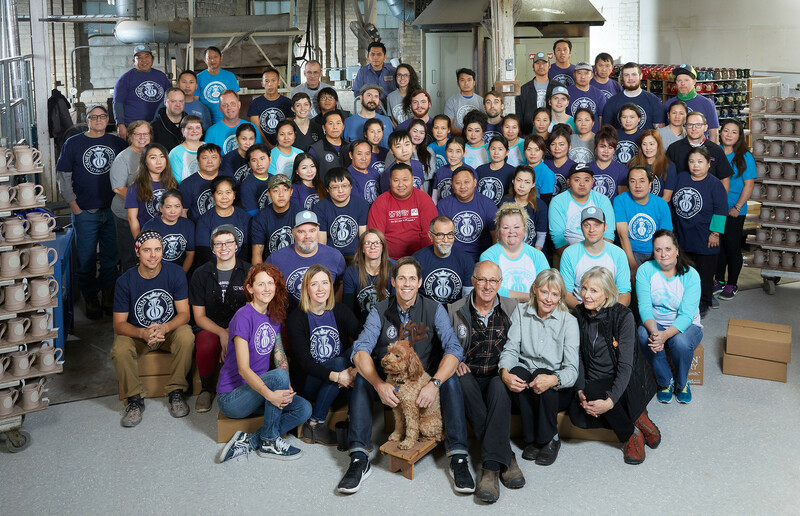 In this post, we’re going to cover our philosophy, inspiration and our actions – from our green initiatives to our community garden to our from-the-earth products. We’re committed to the philosophy of “leave it better than we found it”. Deneen Pottery Runs on Solar Power! In 2017 we started working with All Energy Solar to see how we could bring solar to our historic brick building. 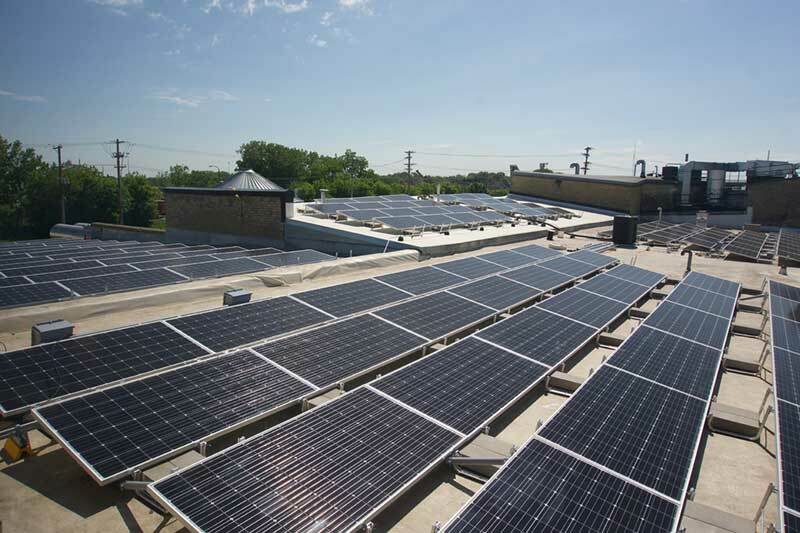 Through the help of MinnPace and Spire Credit Union, our 137 kW system was approved and in May of this year, the installation began. Although we hit some road blocks along the way, we’ve worked through them and today we have 399 solar panels on top of our roof! It’s a big investment and one that will not only reduce our electricity use but also prevent more than 2,170 metric tons of CO2 from being created over the next 25 years. This is equivalent to planting 55,660 trees; not burning 2,331,623 tons of coal; taking 457 passenger vehicles off the road for a year; or not consuming 244,728 gallons of gas. 1. Recycling bins throughout our studio prevent us from creating excess trash. 2. Compost bins are in use in our lunchrooms enabling us to recycle all of our organic waste. 3. Hand crumpled recycled newsprint is used within each mug box. 4. We only use biodegradable starch packing peanuts that easily dissolve with water. To give you some perspective: the total cubic feet of biodegradable peanut packaging used by our staff in 2017 was 37,440, which is equal to half the size of a hot air balloon. In addition to our green initiatives around the office, we’ve also thrown our support behind local Merriam Station Community Garden. Why? First and foremost, we love working with our hands and being active in our community. Being part of something bigger that benefits our community is just a no brainer. While we have our own plot to grow our own veggies and flowers, we also volunteer on garden projects. Working alongside our friends and neighbors to improve what was once an abandoned parcel of land has been awesome. Plus, it’s a family activity, so TT and E are learning the value of hard work and sustainability from a young age. As potters that work with clay, we also feel a deep connection with the earth. 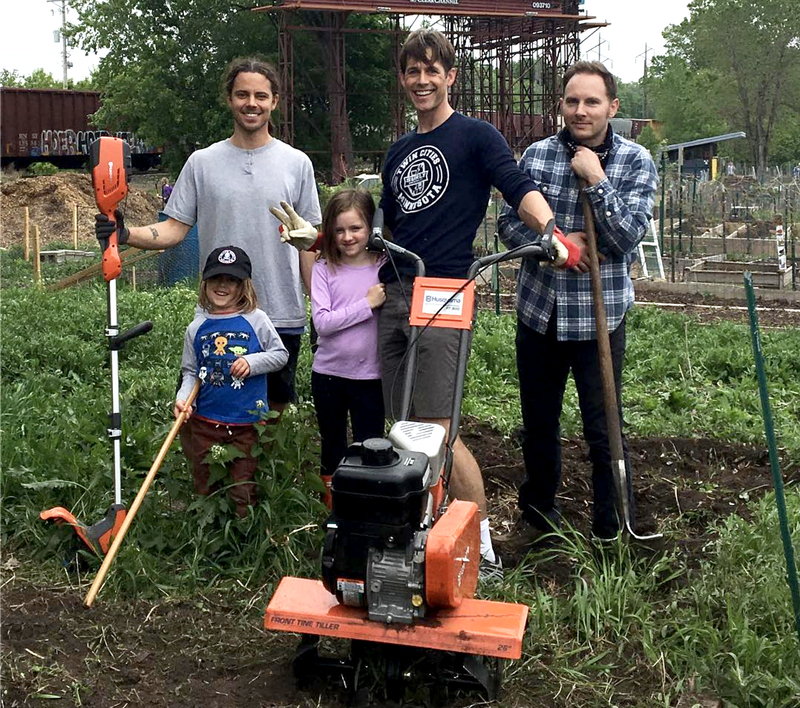 The new garden fits in line with a more communal approach to business, built around our shared interests with fellow employees, community members, and clients, alike. We’re blessed to work with wonderful clients, like Husqvarna, that also see the value in connecting with the community. This year, Husqvarna donated a brand new tiller and trimmer to our garden, which greatly cut down on the time it took to finish our initial ground preparation. It’s rewarding to see so many people come together to plant, tend and grow seeds into vegetables and fruits. The lessons we learn from being committed to a process and patience works well for growing food, making pots and caring for the planet. Working with the earth-hewn ingredient of clay keeps the staff at Deneen Pottery personally connected with our planet on a day-to-day basis. By using raw materials that are born from the earth and a basic firing process that has been with us for centuries, we feel very connected to the planet – and it’s something we passionately want to preserve. The process of creating handmade products allows us to fall into a repetitive set of movements that can become a form of meditation, where we are free to explore our thoughts while engaging in a visceral way with a piece of the earth. Another cool thing about our handmade products is that every mug produced in our shop and distributed to the consumer keeps hundreds, even thousands, of disposable cups from being used over a single mug’s lifetime. Now that’s something to be proud of. Can you get behind this philosophy? We urge you to take any action you can to get behind green improvements in your day-to-day life and community – tell us how you’re leaving our planet better than you found it in the comments! As always, if you have any questions about our pottery process, or would like to order mugs for your business, boutique shop, restaurant or any other organization, get in touch with our team today! Contact us.